In my forays into international grocery aisles, I’m constantly finding more and more fermented food and drinks we haven’t tried like canned kimchi, kombucha, and kvass (keep an eye out for a future review on that one). On one of my last visits to the Lakewood Saar’s (probably the same trip I bought the Frutiking), I spotted a bottle of tepache, below the familiar Jarritos, Mineraga and sangria. What’s tepache you say? Well I’m glad you asked, because I put way too much time on these posts doing background research on what the products we eat and drinks actually are. Thank goodness for Wikipedia! It’s not just useful for college papers! 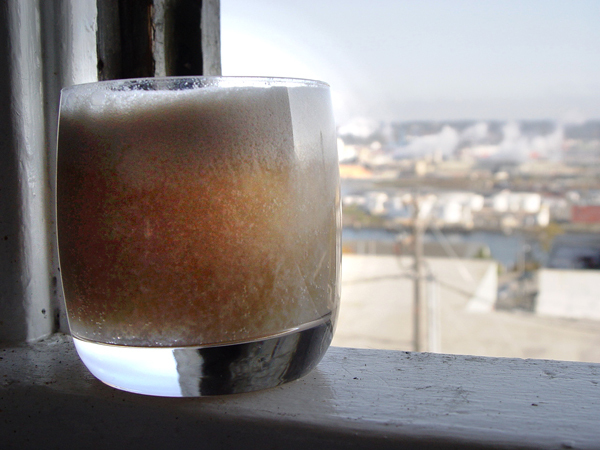 Our particular tepache is non-alcoholic and made with 12% juice. Ingredients include: Purified carbonated water, fermented pineapple extract (skin and pulp), barley, spices, sugar, brown sugar, and vitamin C.
The drink is tangy, akin to the glaze on a slice of pineapple upside-down cake from last’s months work potluck or the fruit cup that you found sitting in the back of your fridge. The flavor is what you’d expect from pineapple juice that’s fermented minus the alcohol: it’s got a twang, it’s a little sour and it tastes much better chilled. Okay it wasn’t that good. If you like pina coladas, getting caught in the rain and possible flings with people who may or may not be your significant other, then maybe you’ll “love” this pineapple cider concoction I crafted with the stuff that was already in our cupboard: a glass of cider, plus some unsweetened coconut milk/coconut milk ice cubes and some simple syrup (add alcohol if desired). But if you’d like to try something that’s probably more palatable, you could always just try it the traditional way, paired with a Mexican beer. 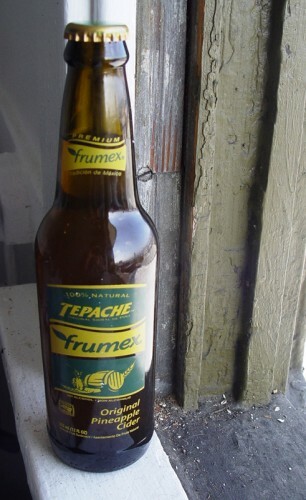 Have you had tepache? Should I try making my own? Did I miss the mark completely? Feel free to educate me! 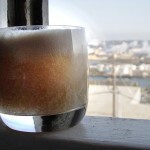 This entry was posted on Friday, October 28th, 2011 at 12:55 pm	and is filed under Drinks. You can follow any comments to this entry through the RSS 2.0 feed. Both comments and pings are currently closed.